2019 Calendar. 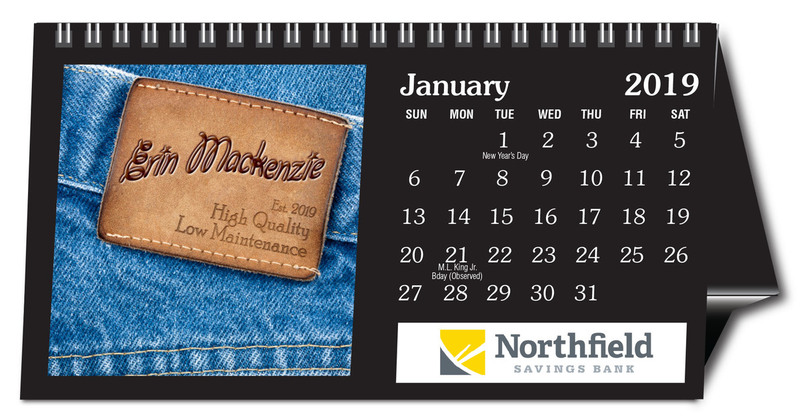 Promote your brand every day with a personalized horizontal tent desk calendar with 12 images. Printed on 100# enamel with Wire-O binding with economic design to save money. Brand new version has black printed pages as background and a black easel to add that extra perceived value. ood to increase employee morale and use at school and youth organizations. Provide excel spreadsheet with name list and every calendar will be personalized with a name. 100 different names mean 100 different calendars! Personalization is "in the image". Full color logo included. This tent calendar is one of eight calendars that feature personalizations. Other popular styles include our I-17, I-12, and I-V1.